1) Which of the following two families were the primary combatants in the Onin War? 2) Which family was traditionally given the post of Kanto Kanrei (Shogunal Deputy in Eastern Japan)? 3) Which location served as the main battleground of the Onin War? 4) What does the "Onin" in "Onin War" mean? 5) Which of the following buildings was constructed by Shogun Ashikaga Yoshimasa after the war, further depleting the Shogunate's treasury and showing how out of touch the Shogun had become? 77% of the entries received had all five answers correct. The most frequently missed question was #2, as some answers confused the Shikken (regents) of the Kamakura Hojo with the later office of Kanto Kanrei (an office that came into existence later under the Ashikaga). 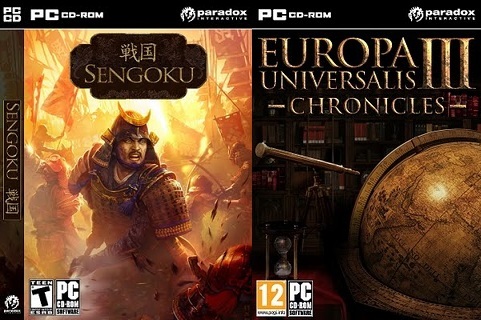 The winners of a digital copy of Sengoku are Christian T. from The Phillipines, Ashley S. from USA, Ian W. from USA, James C. from England, and Christian R. from The Netherlands. The winners of a digital copy of Europa Universalis III Chronicles are Robert M. from USA, Michal Z. from Poland/Czech Republic, Bruno P. from Portugal, Gonçalo P. from Portugal, and Jon L. from USA. All winners have been sent their codes via email along with instructions on how to redeem them. If you haven't received the email within 24 hours of this post, please contact us at randyschadelATsamurai-archives.com (replacing AT with @). Thanks to all who took the time and effort to enter, our friends at Paradox for supplying the great prizes, and a special thanks to Boel and Daniela at Paradox! If you're still without a copy of this great game, consider picking it up from any of these outlets. Watch for the SA's review of the finished game within the next couple of days.